I’m a big fan of Thai massage. Developed in Thailand and influenced by traditional medicine systems of India, China and Southeast Asia, this type of massage involves deep kneading and firm, rhythmic pressure. What I really love about it is that it’s very effective in making your blood circulate. In fact, you can really feel it run through your veins as your whole body is being massaged. While Thai massage can be very relaxing, the problem is that it can be quite expensive especially if you have it regularly So, one great solution is to buy a massage cushion instead. Some back massage cushions were primarily made for the specific type of massages such as the HoMedics MCS-510H Thai Massage Cushion. 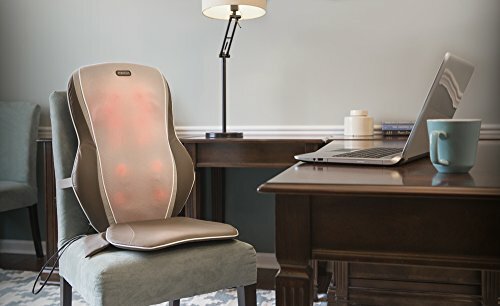 This massage cushion has four traveling nodes and six different massage programs. One feature that most people really love about it is that you can control the massage nodes so it stays and focus on one spot. If you don’t like soft massages but are not into too hard kneading either, this model is perfect for you. As per coverage, some people as tall as 6’1 finds it comfortable although they suggest finding a chair to place it on. Some people find the heat a bit weak, although most say it’s not a problem for them especially considering the great massage and the price of this cushion. Traveling thai massage with four independent nodes tailor your massage style: kneading for deep massage and rolling for gentle massage. Prefer massages that are neither weak nor too hard. Prefer Thai massage but find it too expensive. Spot massage feature holds the massage right where you need it most. The six massage programs enable the user to let the massage meet the needs of his body. May not cover entire back for people taller than 6’1. Heat may not be enough for some people. You may need to find a chair to place the massage cushion on. We were visiting relatives for an extended period but didn’t bring a massager so we ordered this one. This is the best made of all the massagers – I’m very impressed with the quality. But, the best part is that my husband loves it. He says the best thing about the massager is that he can stop the movement on a particular trouble spot and isolate the muscle. Excellent! !